The sustainability of cocoa production must be improved: cocoa farming needs to be modernised to increase yield efficiency and reliability, thus improving the farm's overall economy whilst ensuring the safety of the farmer, his community and their environment. Cocoa is an "orphan" commodity: cocoa has not benefited from the high quality internationally coordinated research efforts of the CGIAR system, and major investments from agribusinesses and plantation companies in the same way as most of the other commodities used by the chocolate industry have. Secure long-term support is essential for the "building blocks" needed to support the global cocoa research effort: Support from the UK chocolate industry towards the conservation, characterisation and safe distribution of cocoa genetic resources has made a major contribution to the global breeding effort to provide improved planting materials to farmers. A long running programme of research to understand the biology of cocoa's pests and diseases and ways to control them, and the physiology of the cocoa plant and how it responds to its growing environment will similarly be of benefit to the whole cocoa research community. Long term commitment and good reputation for cocoa research is important for successful partnerships with research institutions and leveraging funding from other donors: A "hands on" approach has allowed UK industry experts to contribute their skills to projects, and helped develop links between research institutes both within Europe and producing countries. Continuous support over many years has built trust and allowed the development of centres of expertise for cocoa research in universities which may not otherwise have had an interest in the crop. Strong partnerships with the cocoa research community have helped the UK industry cocoa research organisations secure substantial funding from other sources towards joint initiatives and take a leading role in international projects. 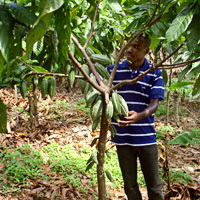 Support for centres of excellence outside of major producing countries allows cocoa to benefit from technologically advanced research and provides opportunities for training the scientific leaders of tomorrow: A programme of projects has been designed to take advantage of cutting edge science, often involving the use of specialised equipment not yet widely available, where appropriate. Many projects involve direct links with institutes in producing countries and often include training/capacity building components. "Addressing the challenges facing cocoa farmers today and tomorrow"